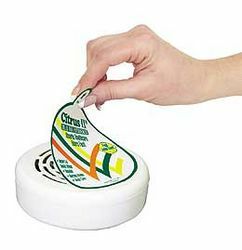 Citrus II-Solid Air Freshener absorbs odors in the healthcare environment and freshens the air. Using a unique formula that utilizes activated charcoal, Citrus II Solid Air Freshener quickly absorbs odors, and freshens the air with a lemon scent. Provides convenient,continuous odor control that freshens up to 60 days. Effective in areas up to 350 square feet.